Today, the BEA released the initial estimate of 4Q GDP. 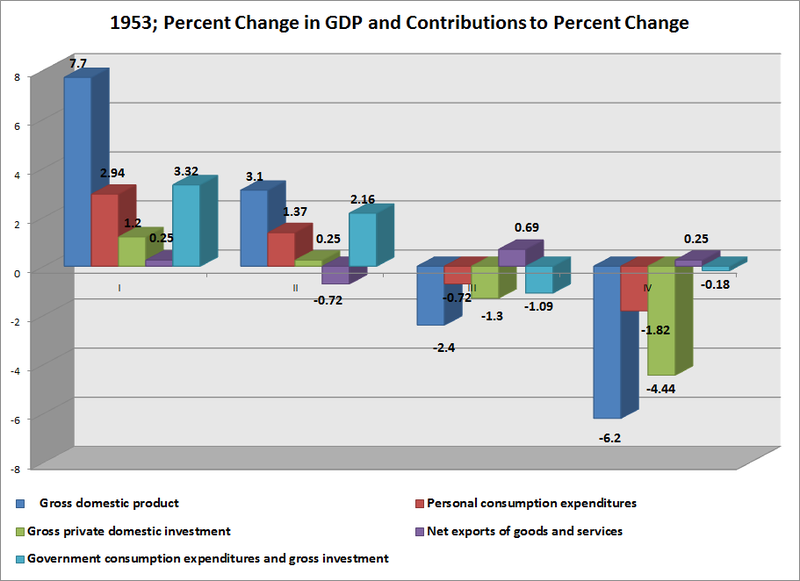 Above is a chart of the percentage change in 4Q11 GDP and the elements that contributed or subtracted from GDP growth. Guess what? Austerity subtracted from growth. This occurred because of contractions at the federal (which subtracted .62 from the calculation) and state level (which subtracted .32 from the calculation). I would be remiss if I didn't add that this is not what Socialism looks like, either. We've written quite a bit here about how mind-numbingly stupid the idea of austerity is. 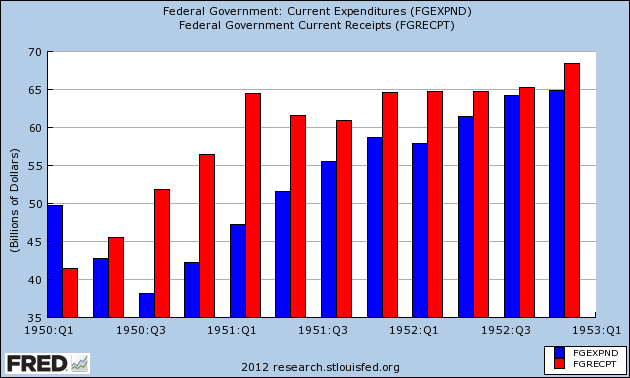 My reasoning is simple: government spending is a component of the GDP equation (which is C+I+(X-M)+G). This equation has been around a long time, and is a basic component of macro-econoimcs. Under the basic concepts of math, if you lower a value in an equation that involves addition, you wind up with a lower total number on the other side of the equals sign. In addition, we have a ton of data from the existing attempts to use this idea that it really doesn't work. Here's a post I wrote a little bit ago titled, "this is not what socialism looks like." In the US, government spending at the state level has been contracting for 6 of the last 8 quarters. Guess what? It's subtracting from overall US growth. We're not the only country to experience this first hand: we've also see it happen in the Baltic States and Ireland. And of course, China spent massively to avoid the effects of the recession and their economy has grown at a very strong pace, proving the point from the opposite side of the argument. Then of course, there was the US experience during the Great Depression when we saw growth rates of around 10% for three years straight and then 5% the following year thanks to government spending. 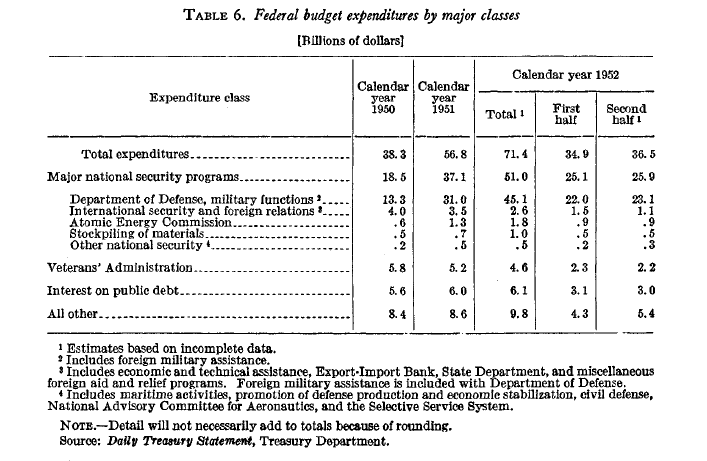 And, as I've noted in my history projects, Korean War spending shifted the US economy into overdrive in the early 1950s (see here, here and here). U.K. Prime Minister David Cameron’s planned budget cuts increases the chance the economy will slip back into recession, said Geoffrey Dicks, who heads economic forecasting at Britain’s new fiscal watchdog. Responding to questions during a parliamentary hearing in London today, Dicks said measures proposed in the June 22 budget led his office to shave 0.5 percentage points from its growth forecast in the “near term.” His Office for Budget Responsibility predicts an expansion of 1.2 percent in 2010. Yep. This many months after the start of the Great Depression, the British economy was rapidly converging back to its pre-depression level of production under Chancellor of the Exchequer Neville Chamberlain's policy of using stimulative policies to restore the price level to its pre-Great Depression trajectory. By contrast, the Cameron-Osborne policies of expansion-through-austerity have produced a flatline for real GDP, and the odds are high that British real GDP is headed down again. In less than a year, if current forecasts come true, the Cameron-Osborne Depression will not be the worst depression in Britain since the Great Depression, but the worst depression in Britain… probably ever. That is quite an accomplishment. Reality continues to intrude rudely and sharply into the proposals of the austerity crowd. Yet, despite the overwhelming amount of data that disproves their central thesis, they continue to cry for austerity. Obviously, facts, data and logic are meaningless now, as, despite the fact that that we have an overwhelming amount of data, we continue to hear from people who argue on the other side of them. We are clearly through the looking glass in regards our public discourse. We see the economy growing strongly in the first quarter, hitting a 7.7% growth rate. Consumers are adding a fair amount to the overall growth, but the real contributor is government spending, which accounts for 43% of overall growth. We see the same type of scenario play out in the second quarter, but government spending now accounts for 70% of all economic growth. The third fourth quarter have contractions, where the big contributor to the contraction is the drop in investment, with consumer spending and government spending also contributing to the slowdown. Also note the severity of the contraction, especially in the fourth quarter, where we see the economy contract by 6.2%. That's a very large drop, and one we're not use to seeing. As readers know, I am trying to reverse engineer the ECRI Weekly Leading Index. Research has revealed that the WLI (per Lakshman Achuthan) has 7 components. 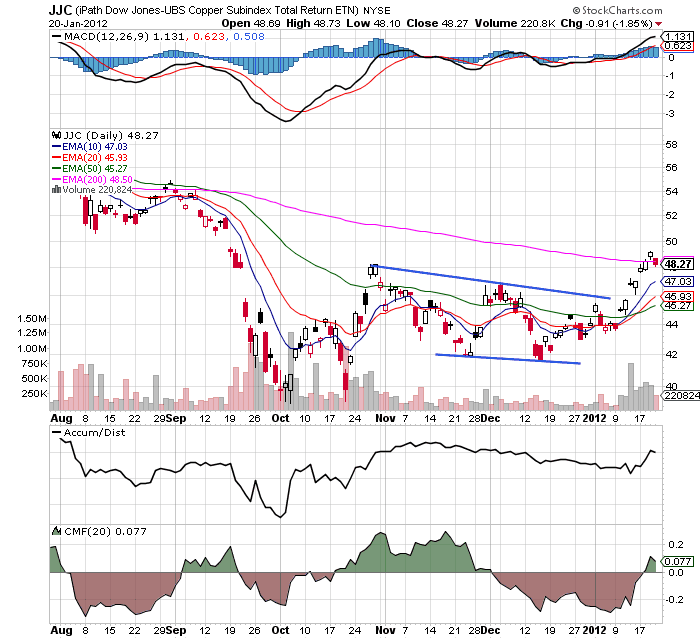 We know that two are initial jobless claims and the JoC-ECRI commodity index. Six of the seven are public record. The unweighted average change is -2.2 if purchase mortgage applications are used, and -0.6 if the alternative real estate loans is the metric. The predicted week over week change is therefore predicted to be negative in either event. A positive result would suggest that commodity prices are weighted more heavily compared to initial claims and either real estate metric. 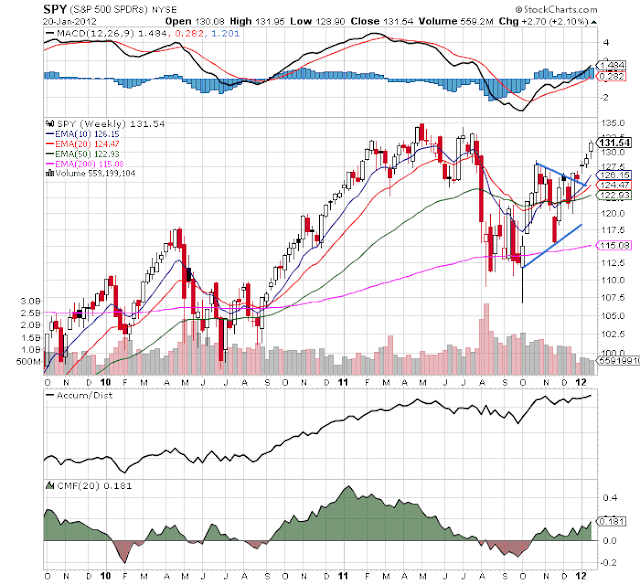 On Monday, I noted that the underlying technicals of the market had changed; more aggressive, "growth areas" of the market were rising. Below are daily charts of (in order technology, financials, energy and health care ETFs). Combined, these four sectors comprise 57% of the S and P 500. 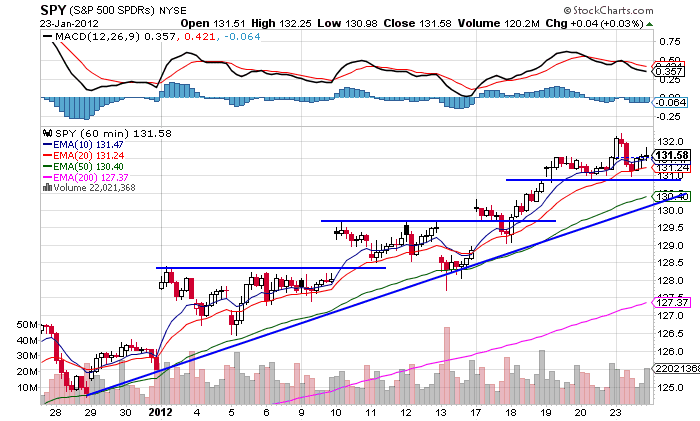 Technology (which accounts for 19.39% of the SPYs) is in a strong uptrend. 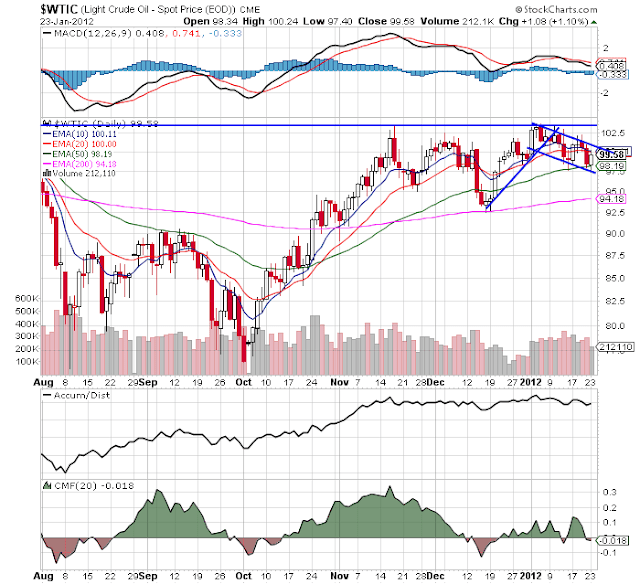 After consolidating in a symmetrical triangle, prices have been moving higher. All the EMAs are rising and the shorter are above the longer. The MACD is positive and the A/D and CMF are all rising. Notice that over the last four days, we've also seen a bump in volume. Financials (which account for 14% of the market) are also rising. 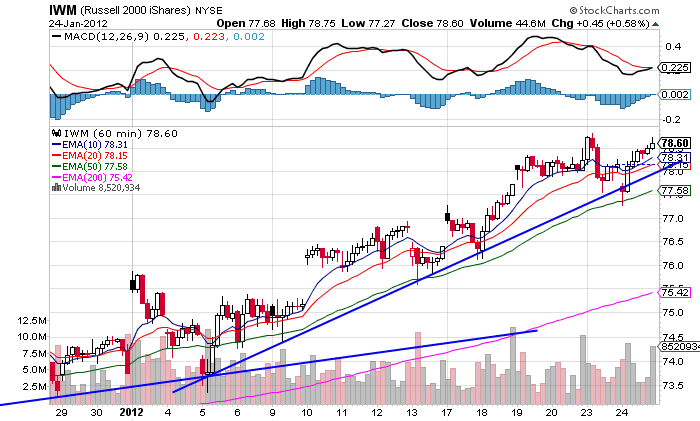 However, add that they have (finally) crossed their 200 day EMA to the picture. Energy is a bit behind the curve, as it it still constrained by the highs of late October. 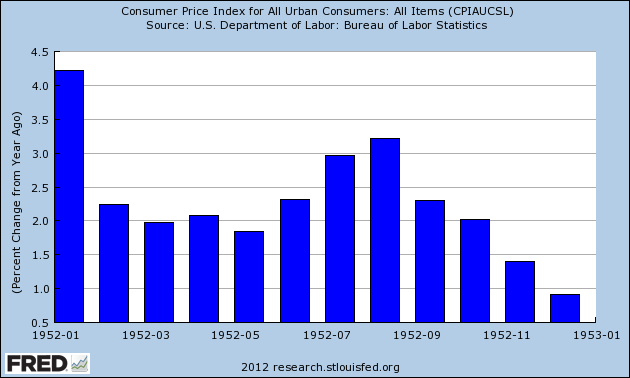 However, prices are bumping up along that line. 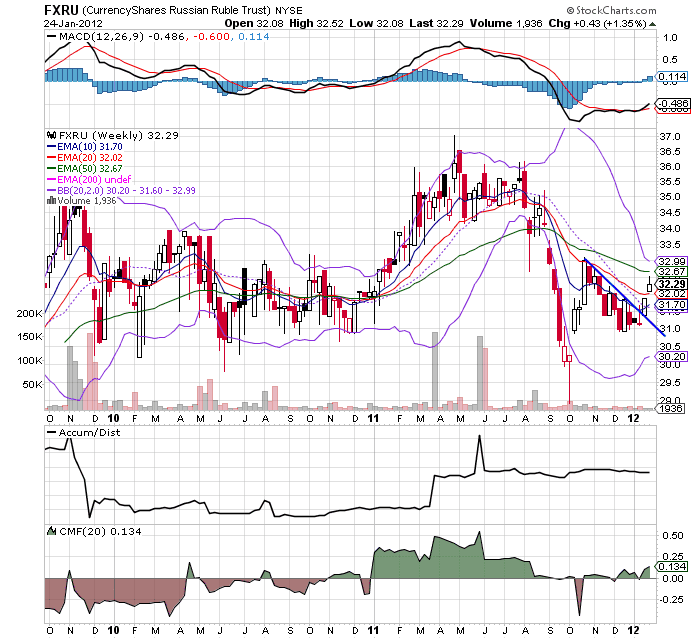 Also note the positive underlying techncials -- rising EMAs and volume indicators. The MACD is not negative, but also not positive, which is obviously a slight negative. 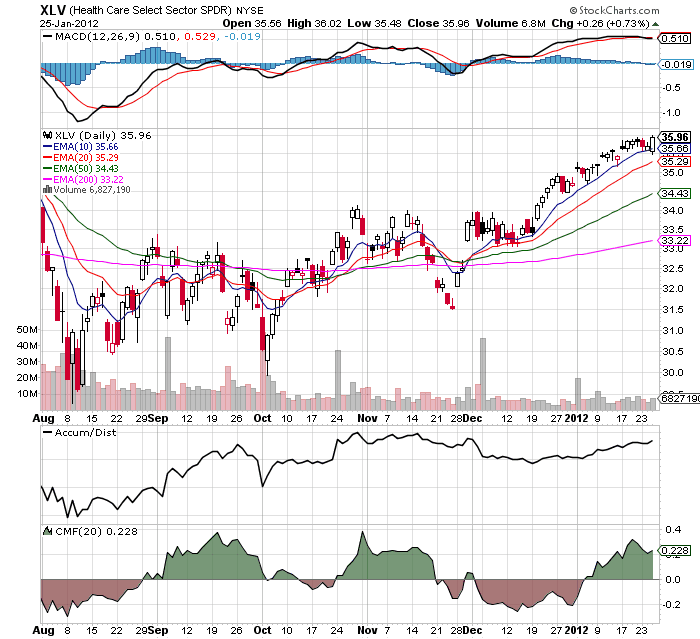 Health care (which accounts for 11.64% of the average) shares all the above bullish points, save one: the MACD is about (or already has) given a sell-signal. Yesterdays prices action, if it continues, could change that development, but we need several days of strong price action for that trend to develop. Overall, the largest sectors are, well, looking pretty good. 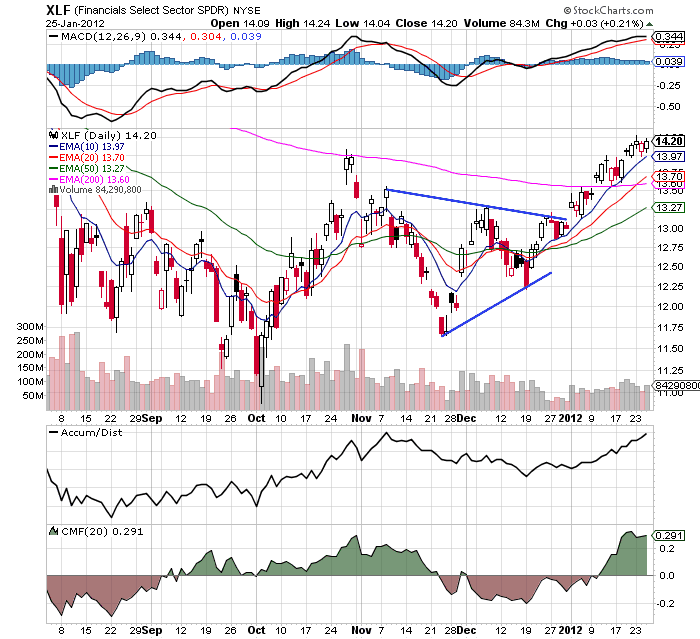 If energy breaks out (which is highly likely assuming the volatile oil market environment) it would replace the possible downward pressure exerted by a correcting health care sector. 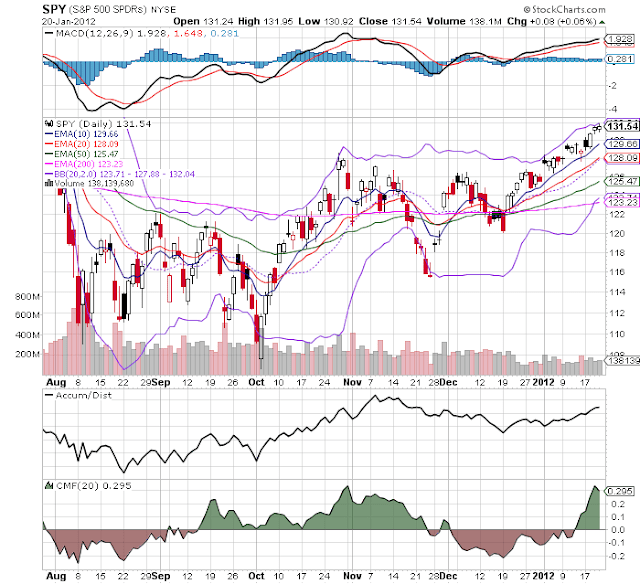 Yesterday's market was really a tale of two markets, with the prices moving sideways under a little after lunch, and then rallying strongly for the remainder of the day. The main cause was the Fed releasing it's statement that interest rates should stay very low for a few years. 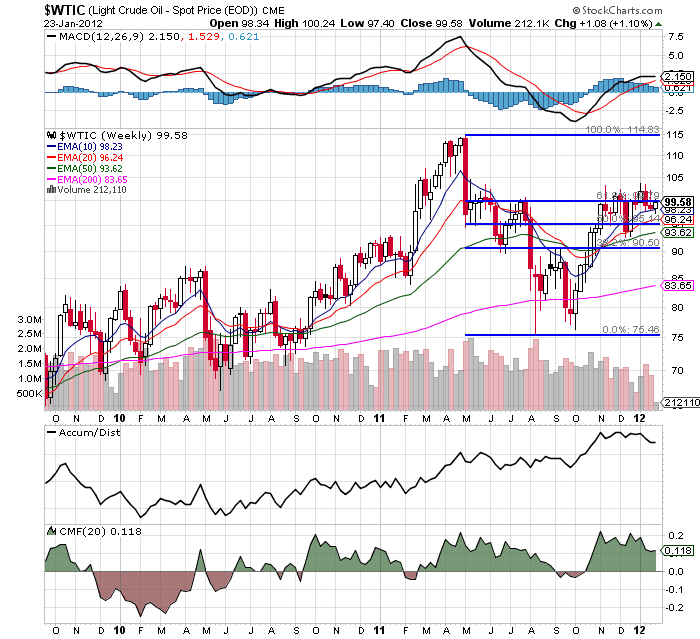 The daily chart shows that prices are still rallying and are in an uptrend. 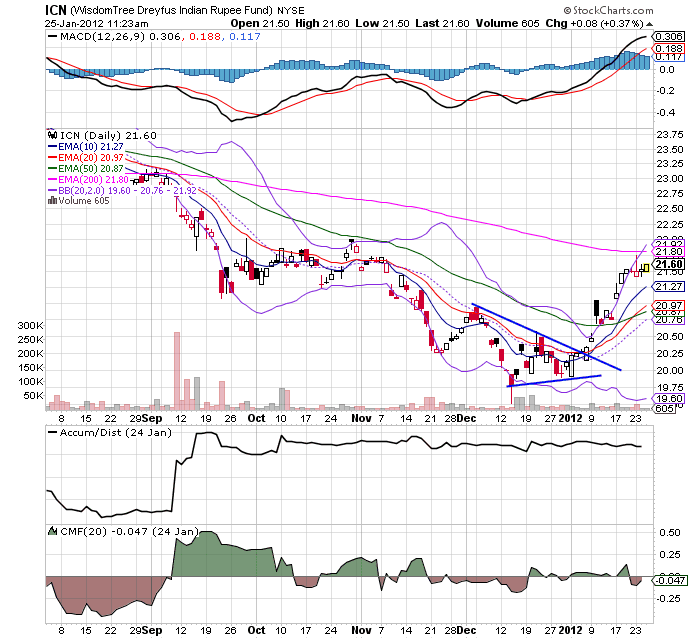 Also note that the MACD have given a further buy signal. 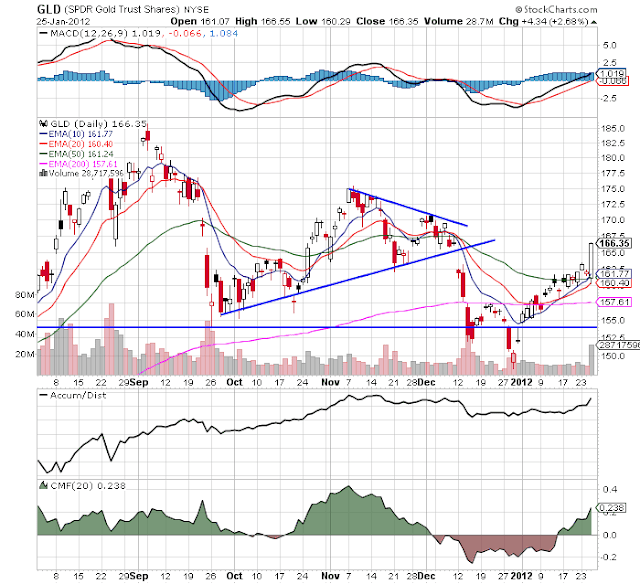 Yesterday, we say a strong pop in gold on extremely high volume. 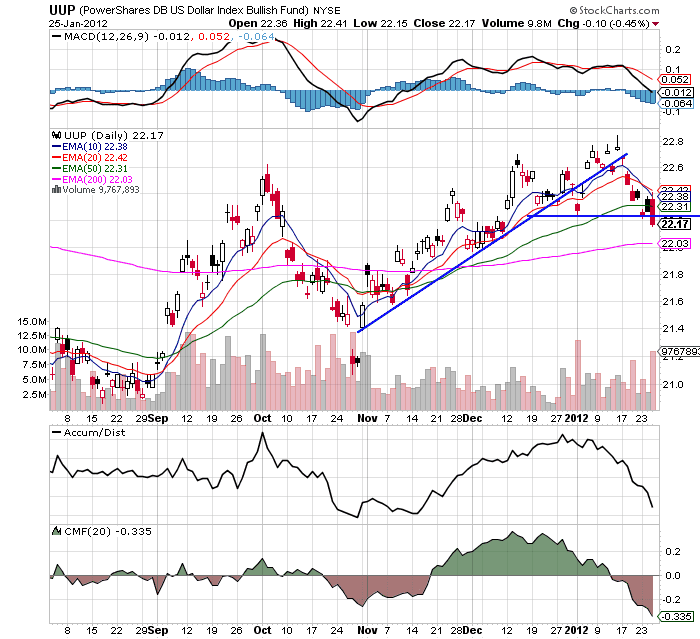 Also note the bullish underlying technicals -- the MACD is rising, the shorter EMAs are rising, and the A/D and CMF show money flowing into the market. The big reason for the move is the perception among investors that the Fed's policy will be long-term inflationary. 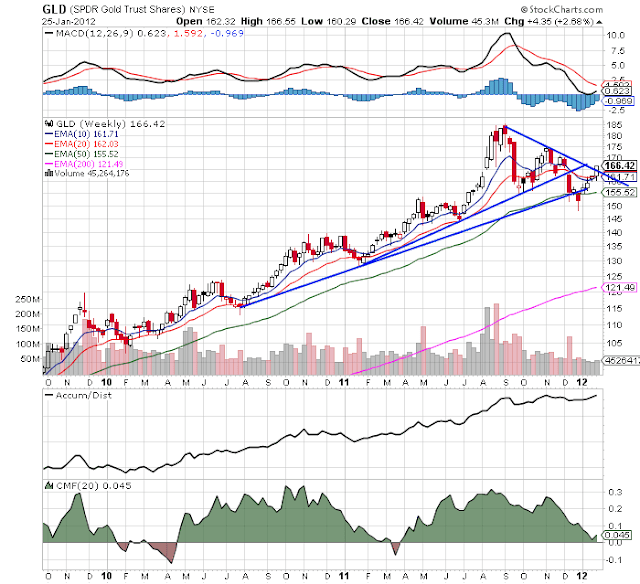 On the weekly chart, gold prices have broken through a longer-term resistance line. 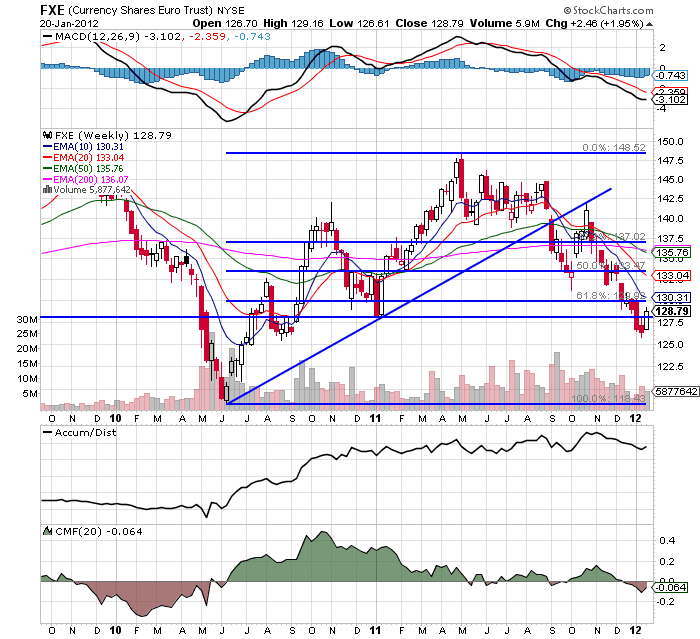 The dollar dropped sharply yesterday, and looks to be moving lower. 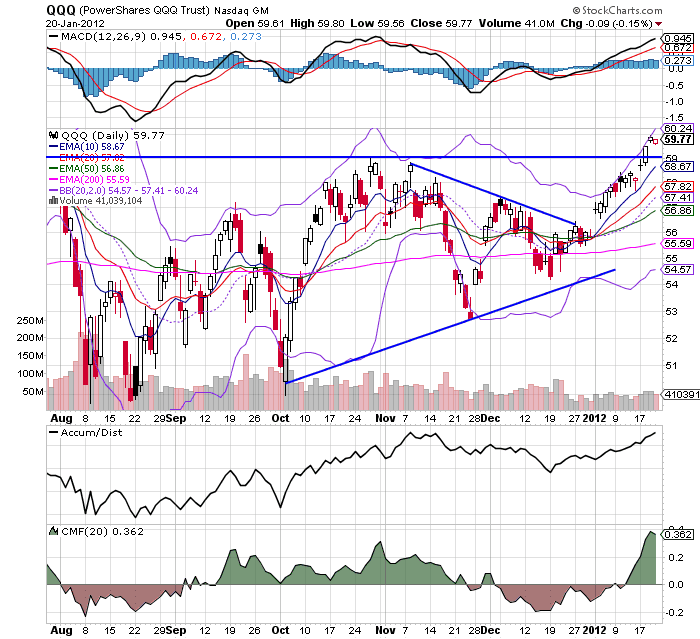 The reason for the sharpness of the drop was, again, the Fed's move. This was a double, negative whammy for two reasons. First, it implies a possible future inflationary environment, and second, it means interest rates will stay low for the foreseeable future. Both outcomes are dollar negative. The first scenario devalues the security and the second means that traders will not have a high interest rate when they purchase physical currency and park it in the US. 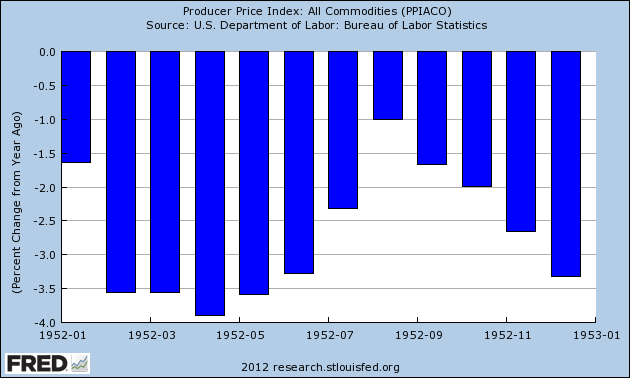 CPI was quite moderate. The YOY percentage change started at 4% and slowly decreased throughout the year to a little under 1%. Now, this type of deceleration can also be a sign of a potential recession on the horizon, which did start in the 3Q of 1953. The YOY percentage change in PPI was negative for the entire year, indicating the input prices were dropping. The above charts shows the absolute PPI level for the year, which shows the drop more completely. 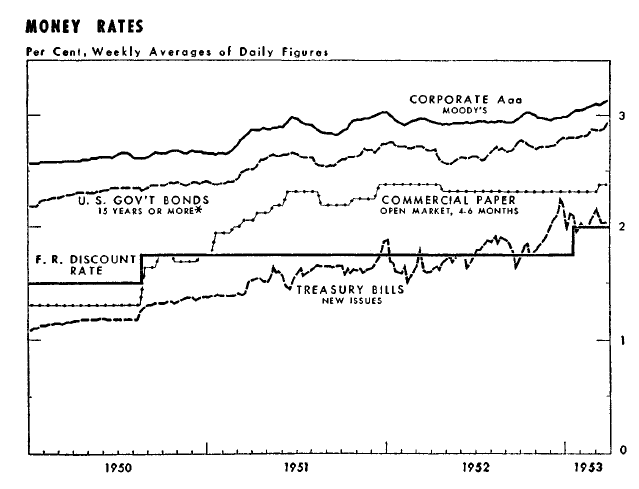 As a result of the stable inflation picture, we see that the Fed did not raise rates in 1952. We also see that interest rates were fairly steady, with the exception of the continued upward movement of Treasury Bills, which jumped higher at the end of the year. The Fed explained the increased as an increased demand for loans at the end of the year. The above table shows the increase in various types of loans over the year. Note the slow pace at the beginning of the year, while we see a big bump in the 4th quarter. We see two reasons for the increase. Business loans increased, with almost all of the increase coming in the fourth quarter. 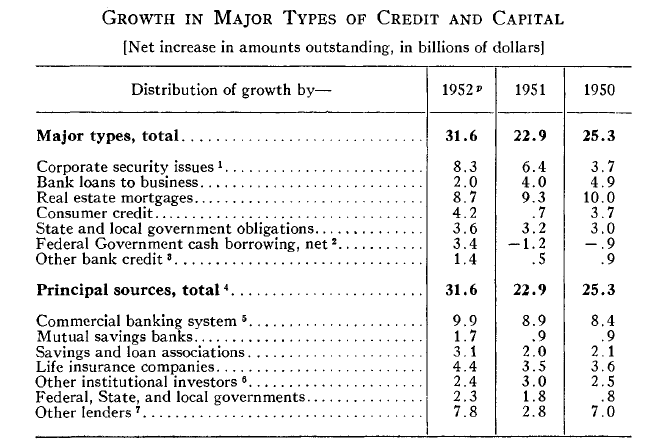 In addition, "other loans to individuals" increased by $2.2 billion , but this increase came from a strong growth in the second, third and fourth quarters (for more on the increase in consumer credit, see the 1952; PCE post). 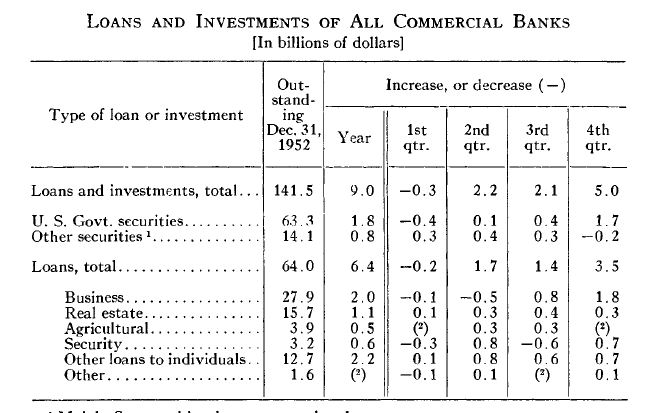 The above tables shows that corporate security issues rose strongly in 1952, and competed for commercially available capital. The increase in 4th quarter lending was probably partially caused by an inability to complete an offering prior the end of the year. 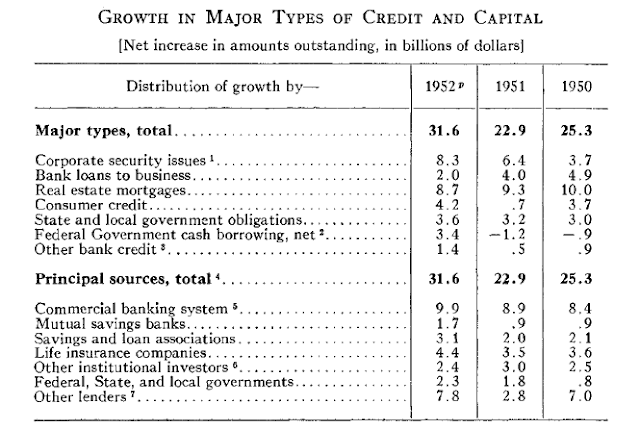 Again, note the large increase in consumer credit. In short, what we see here is a fairly stable financial system. 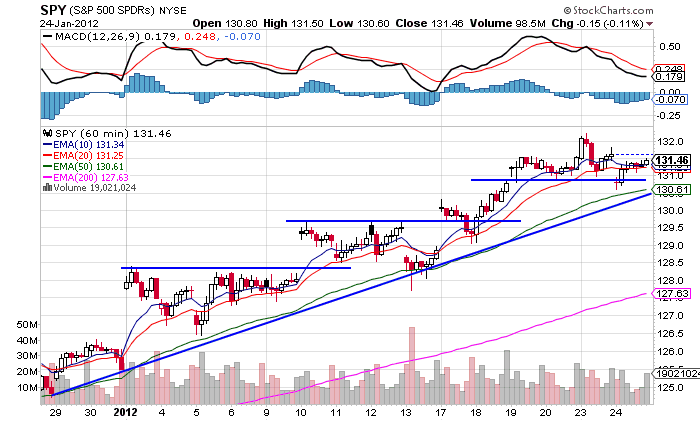 Granted, they're breaking out from low levels, but they are breaking out. I've shows this graphic a few times in various forms, but it really deserves to be repeated. At the federal level, we have two issues: low tax receipts and high spending. As I've pointed out a few times, the big issue in the spending room is health care costs in the federal budget. However, at some point, taxes are going to have to go up as well. The above graph is from Econbrowser. All three, 60 minute charts of the major equity averages show that prices are still in an uptrend. The dollar is a different story. 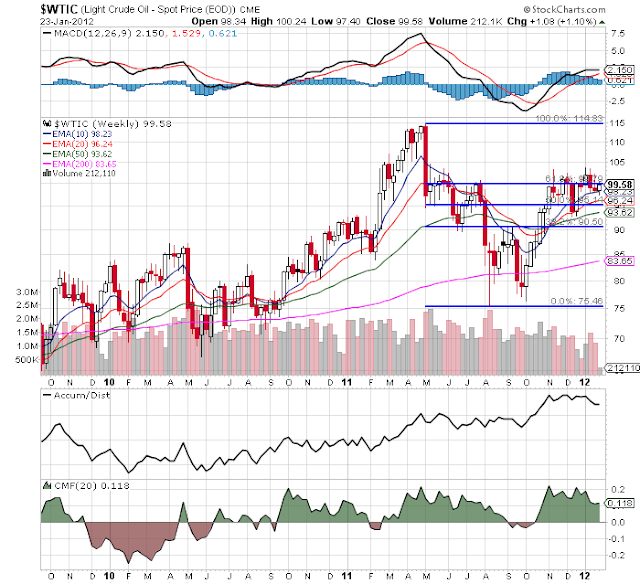 The top chart (a daily chart) show that prices have broken their uptrend and found support at lows established in early January. 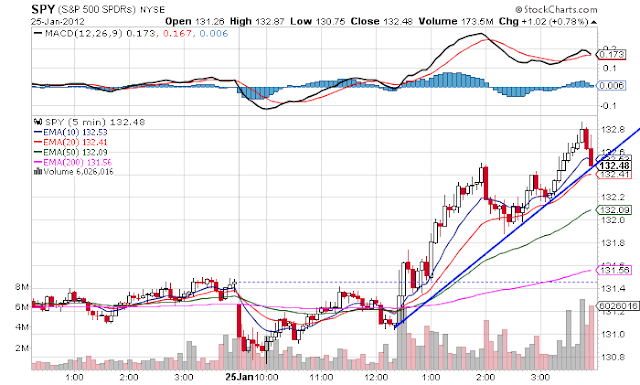 In addition, the shorter EMAs are moving lower and the 50 day EMA is moving sideways. The MACD has given a sell signal and the A/D and CMF show money is leaving the market. 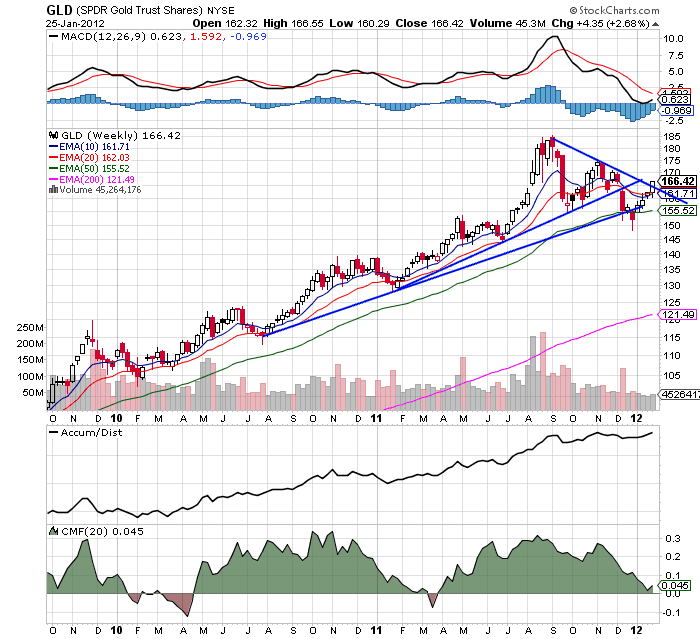 On the lower, weekly chart, we see that prices have broken their upward trend line. 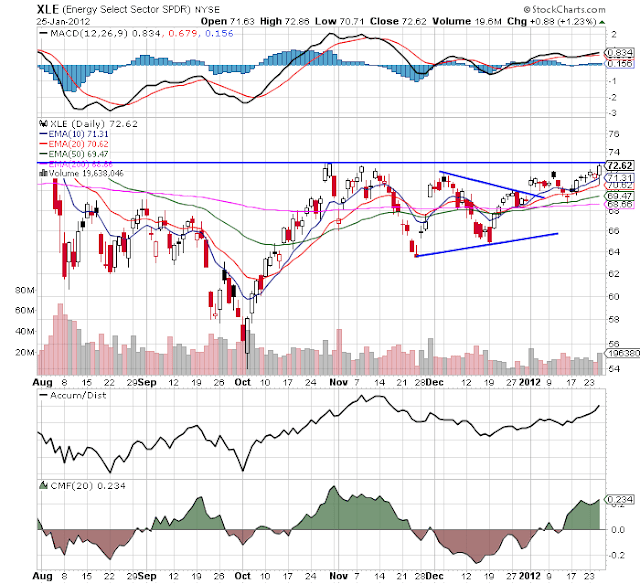 While the MACD is still positive, it is approaching a sell signal. However, the trend break is the real story here. This is a chink in the bullish market argument, as a rising dollar would be a sign of improved investor sentiment toward the US economy as a place to invest. Some of this decline is due to the euro's recent risk (it has broken it's downward sloping channel patter). However, I'm guessing there is also some second guessing occurring regarding the US economy's overall situation. 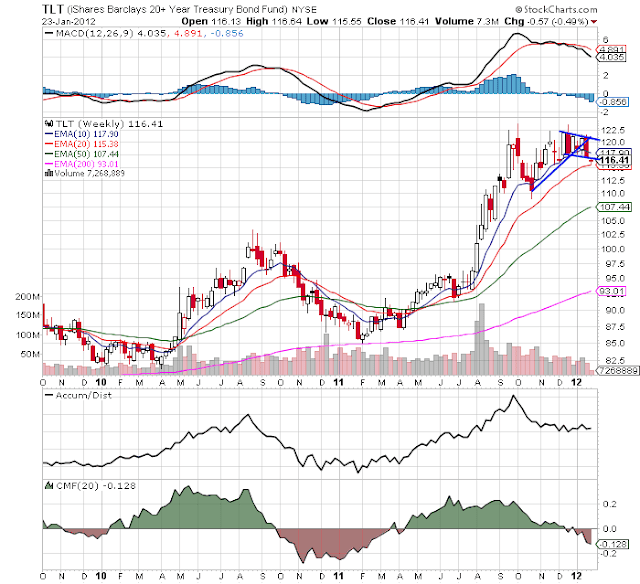 After breaking slight upward sloping trend lines, the IEFs an TLTs are hitting support established over the last few months. 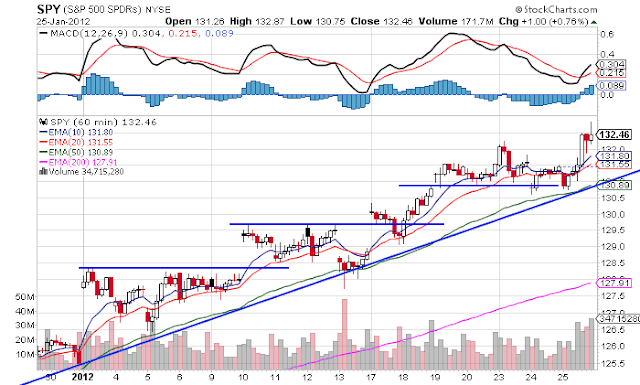 Prices need to make moves through these support levels to give the bulls added upside momentum. Right now, it appears we're seeing a bit of upward hesitancy. This is to be expected, given that last week we saw prices move through important technical levels. However, a pause can quickly turn into a reversal with the right fundamental change, so we definitely need to keep our eyes open. I'm including information on the 1950 and 1951 federal budget situation in this post, and will continue to look at federal expenditures and receipts from this point going forward as part of the Bonddad Economic History Project. So -- why the difference. My guess is the BEAs data is the result of a far more complete data set being available for the measurement. 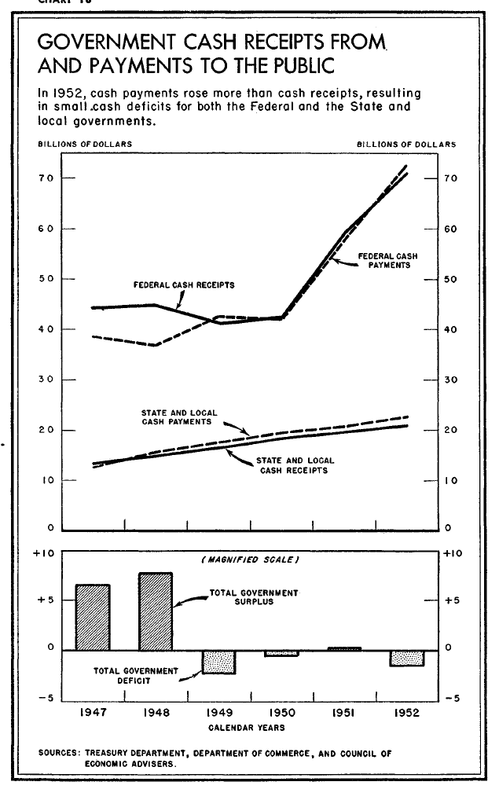 The above chart shows the increase in the deficit as measured in the 1950s occurred in the second half. My guess is, given the lack of computerization in the 1950s, the second half had a much stronger revenue collection than previously estimated by the Treasury. 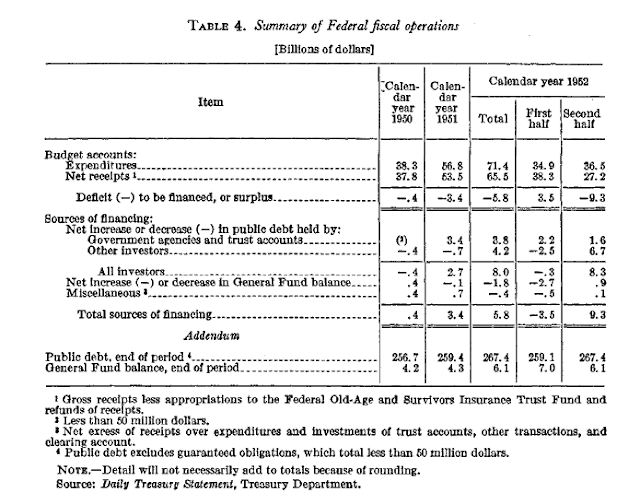 By the end of 1952, US nominal GDP was $371.4 billion and the total public debt outstanding was $267.4 billion, giving us a debt/GDP ratio of 72% -- a very manageable amount. 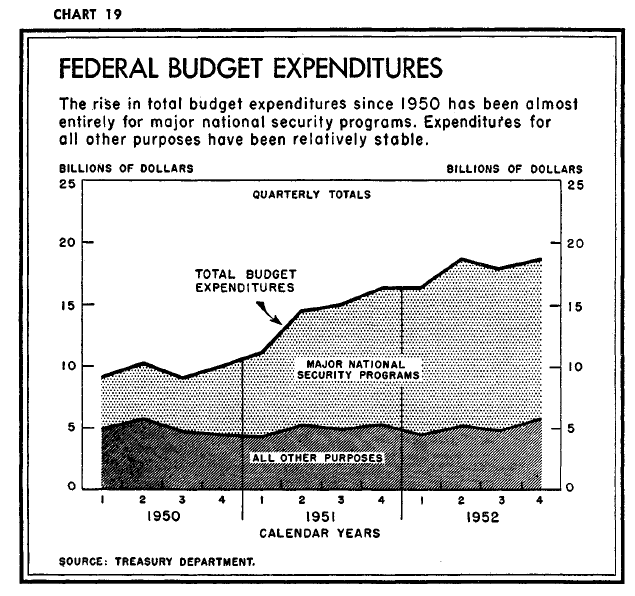 The above chart places the Korean War expenditures in graphical form, shows the extreme amount of distortion caused by the war spending. Last week, we saw the release of both CPI and PPI. I wanted to take a closer look at both reports. The YOY percentage change in total CPI is now moving in the right direction. It has decreased for three straight months -- which is a positive development. 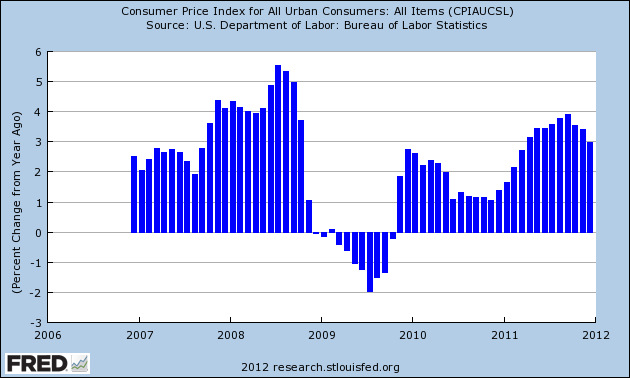 However, the YOY percentage change in core CPI is still rising, although this is still below 2.5%. Overall, the YOY percentage change in overall PPI is declining as well. 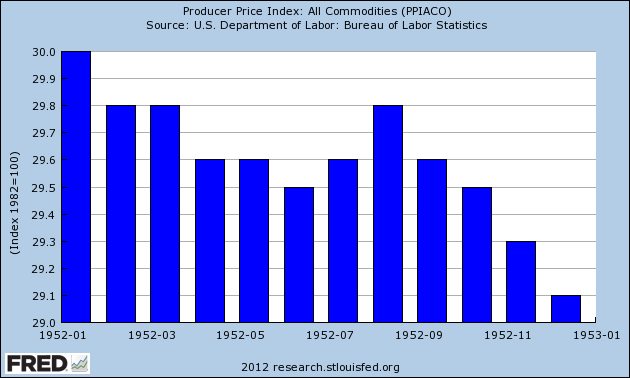 The above chart shows the YOY percentage change in PPI and CPI over the last 30 years. 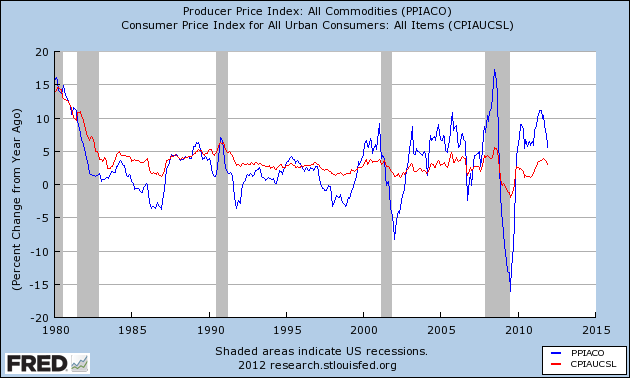 Notice how far more volatile PPI is relative to CPI. 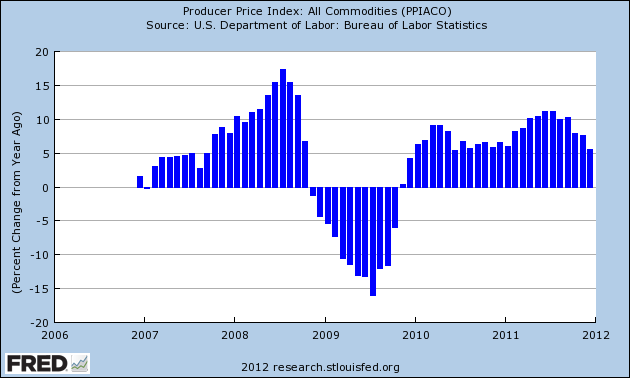 Also note that, regardless of the wild moves in PPI, CPI absorbs the price moves very efficiently. 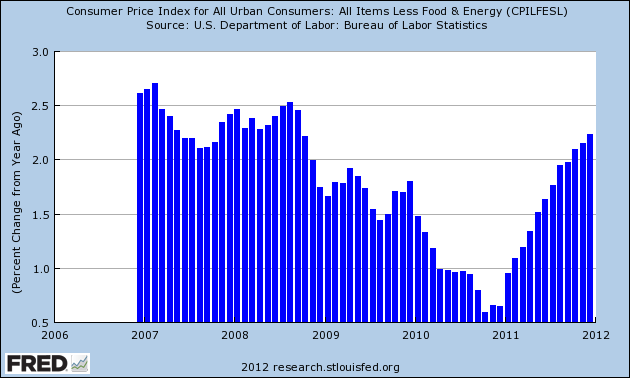 My concern is still food prices. Although they sold off last week (thanks to the USDA underestimating the South American crop), grains are looking at a fairly volatile 2012 when price spikes are possible. However, overall, inflation appears to be contained for now. 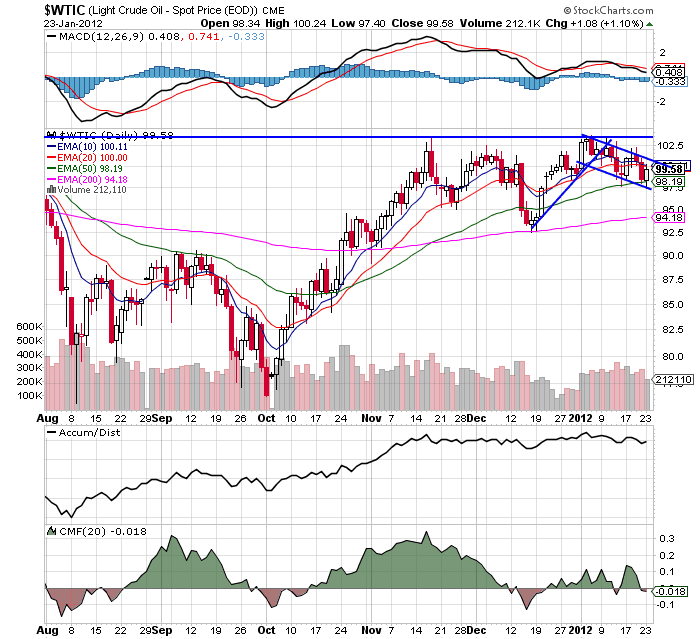 Today, I wanted to start with oil, which is still contained by it's mid-November high. Since the beginning of the year, it has been in a slightly downward sloping channel, but it's overall range has been about 6 points -- hardly a violent series of price swings. 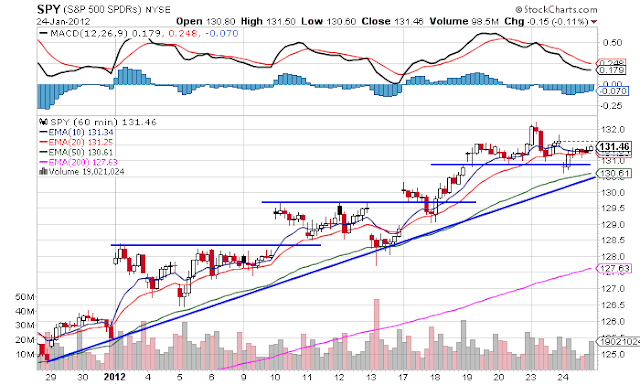 However, above the 105 prices level, there is a ton of room to run. 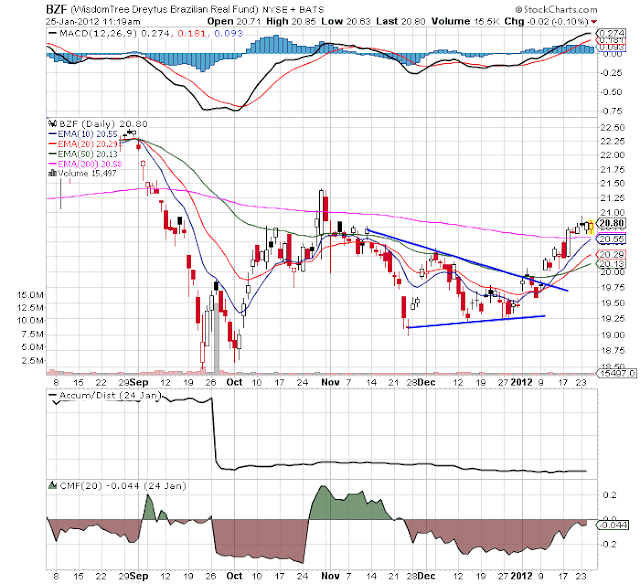 In addition, after consolidating after a mid-year sell-off, the Brazilian real has broken out of its consolidation range and rallied fairly strongly over the last few weeks. The 60 minutes SPY chart really shows the price action in it's most important manner. Prices are slowly moving higher, but consolidating as they go. From a day trading perspective, this is an incredibly difficult market to make money in. The weekly treasury chart shows the important price action in the most detail. 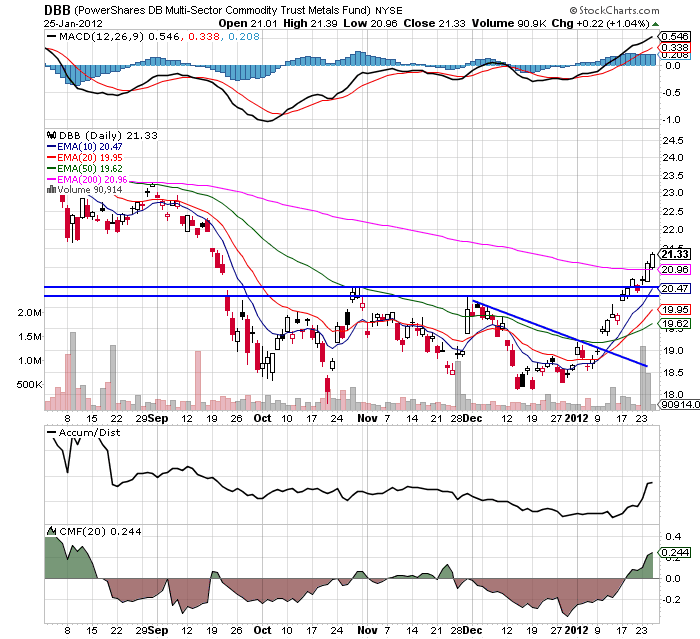 Prices hit resistance in the 120/122.5 area. However, money is starting to flow out of the market (declining A/D and CMF) and momentum is turning against traders (declining MACD). Prices have support of the 20 day EMA, but below that, prices would have to fall a few points to find decent support. The weekly chart for the IEFs shows the same thing for the belly of the market. In short, things appear to be moving the bulls way. Equities are rising and treasuries are falling. 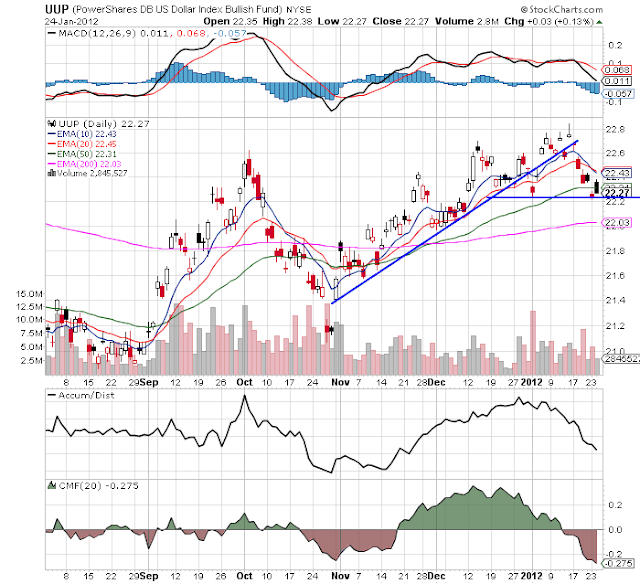 The daily chart shows that the euro has caught a bid. 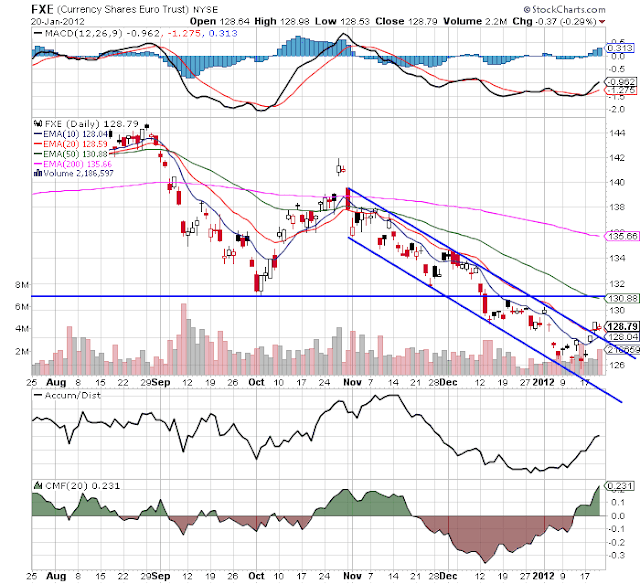 It has broken out of the downward sloping channel and moved through the 10 day EMA. Money is flowing into the market and momentum has turned up (although the MACD is still negative). The next logical trading target is the low established in early October. On the weekly chart, the 10 week EMA and the 61.8% Fib level are more or less at the same point, so they provide a good target as well. So -- why is this happening? Last month, the ECB created a large lending facility that added a ton of liquidity to the banking system. As such, the fear of wide-spread bank defaults is decreasing, leading to investor confidence in the region. The WSJ has more on the lending program here. 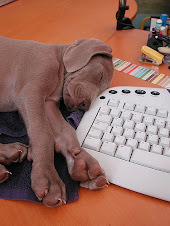 Just to review my overall analysis of the economy and the markets. I turned more bullish on the economy last week. I outlined my general thesis here. 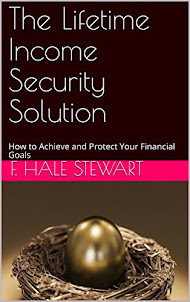 There are several key points to the argument, with the first being the drop in initial unemployment claims followed by the general steadying of the employment situation and the rest of the economy holding its own. The real wild card is Europe, where a wave of defaults across the region would obviously cast a very dark cloud over the US. 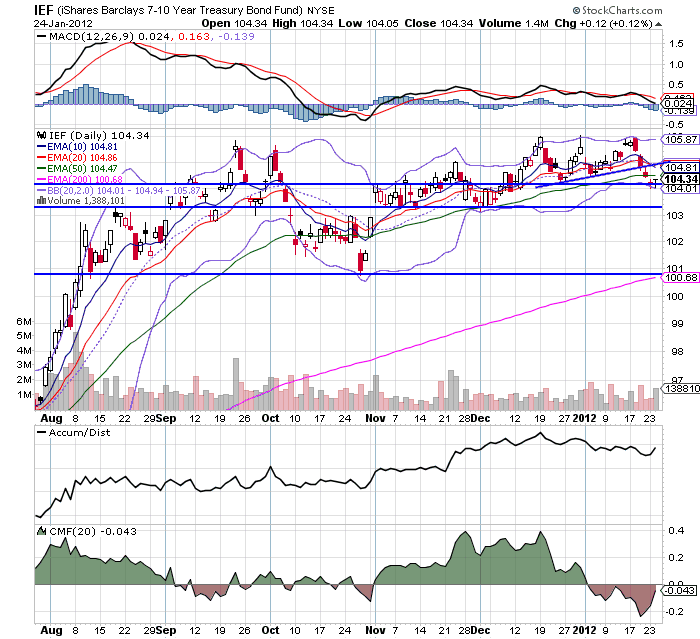 As for the markets, we've seen the equity markets move higher and a sell-ff in the treasury markets. The dollar is still doing well and copper has made a comeback. Last week, the leading market sectors were energy, technology financials and consumer discretionary, so traders are making bullish economic bets. 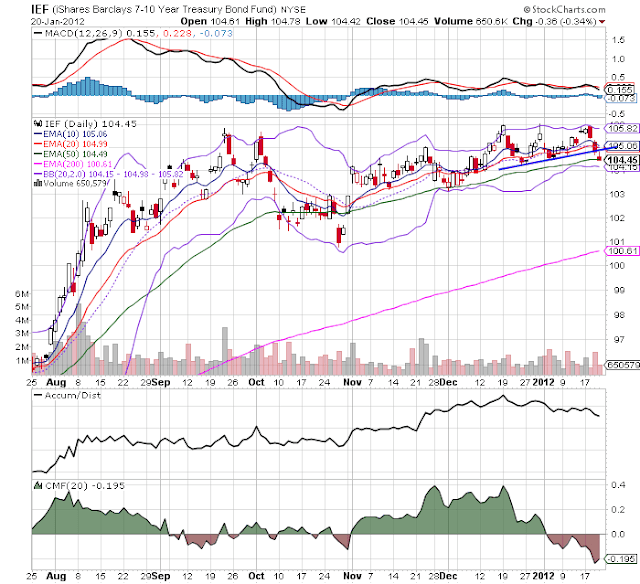 Moving forward, the big concern is to look for economic and market weakness. The QQQs are in a bullish orientation. Prices consolidated in a symmetrical triangle and then rallied through October highs. The EMAs are bullishly aligned, money is flowing into the market and momentum is positive. However, given last week's advance, I would expect a pullback sometime in the next few weeks as traders catch their breath. Also note some general profit taking is probably in order. 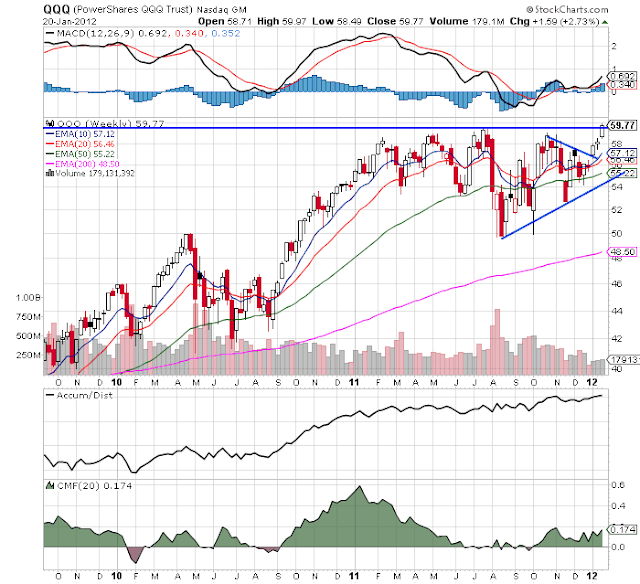 The QQQs weekly chart shows that last week's price action printed a strong bar. Also note that the A/D and CMF line have not turned negative over the last year, although the market as a whole has been weaker. This tells us that money has not left the market, but new money has not come in. 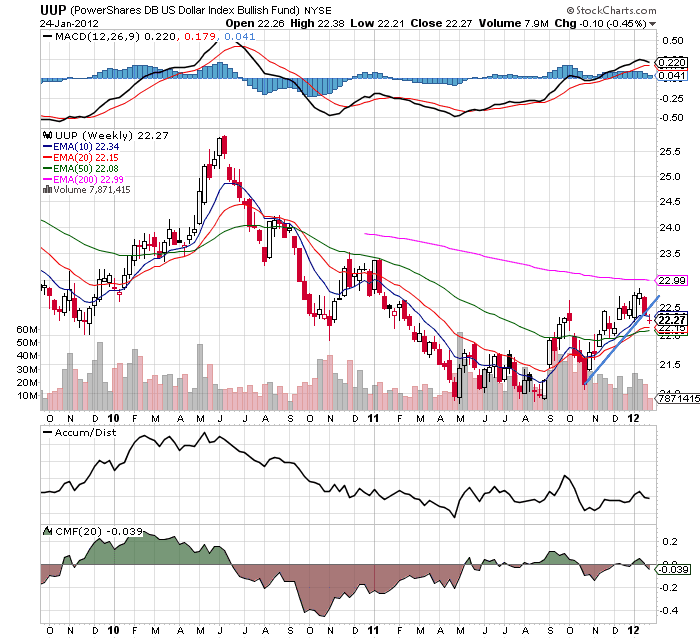 Finally, the MACD is in a position to move higher. The SPYs daily chart shows a meandering rally, with prices moving up incrementally. However, we're seeing money move in and momentum increase. 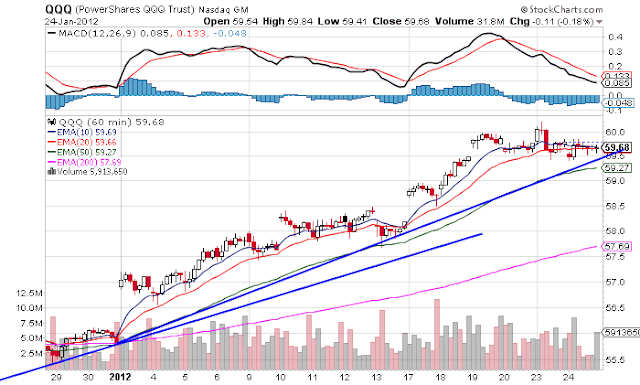 However, like the QQQs, I wouldn't be surprised to see prices move back to the EMAs on a slight sell-off. 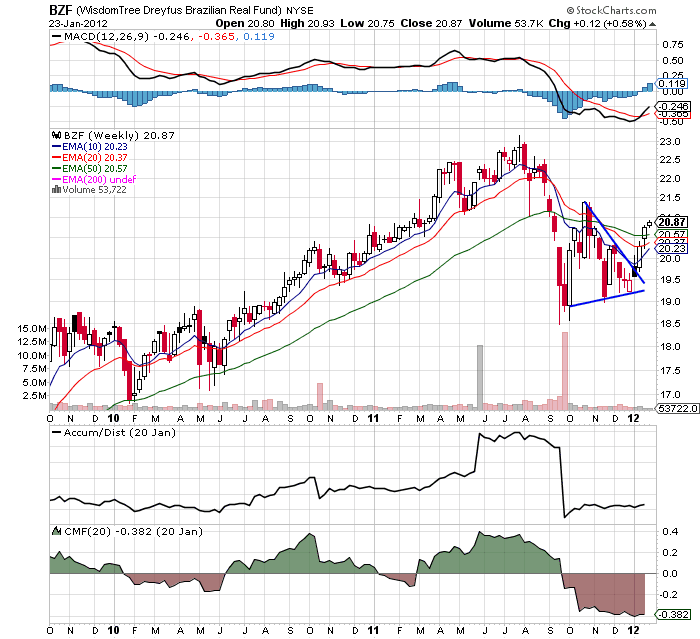 The weekly chart is more bullish. Prices consolidated in a symmetrical triangle and have moved higher the last three weeks. Money is moving in and momentum is increasing. 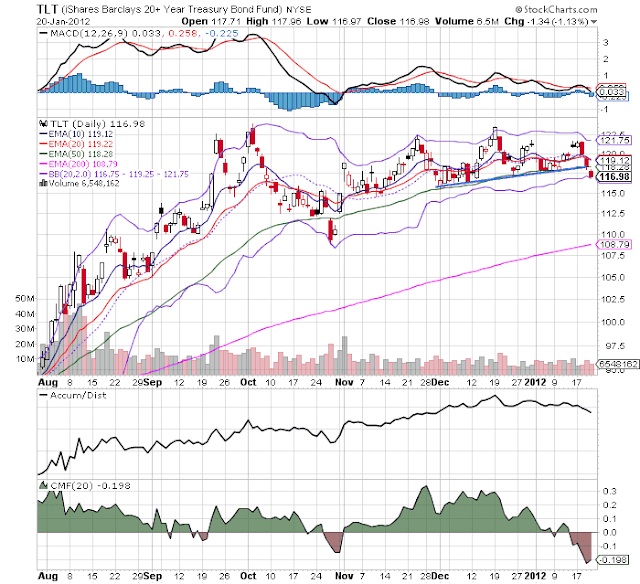 In addition, both the IEFs and TLTs have moved below short-term trend lines. This is welcome news for the bulls, as it indicates there might be a chink in the safety trade. It's still early, however. Copper has broken through the short-term resistance of its downward sloping trend line and the 100 day EMA. 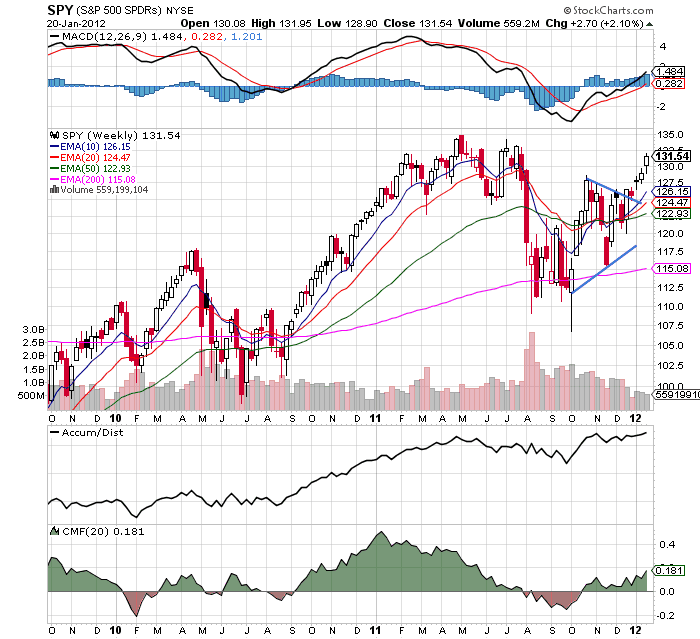 However, like the equity markets, I would expect a sell-off this week, largely to take some profits off the table. 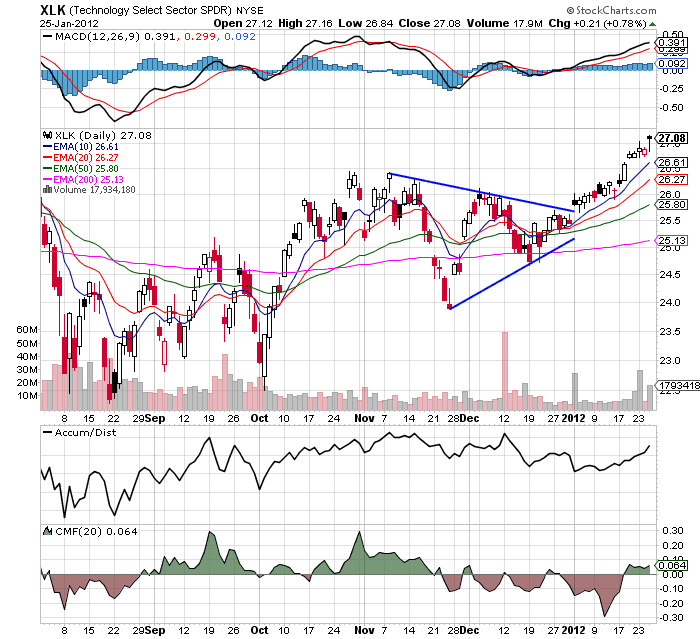 As I've noted several times above, I would expect to see some selling over the next few weeks; we've had a decent rally through resistance, so that would be an appropriate response for the moment. That would also let traders "catch their breath" in order to assess the economic background.